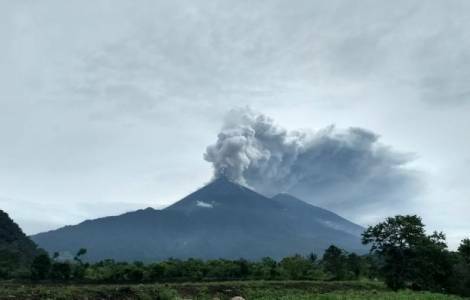 Guatemala City (Agenzia Fides) - At least 25 people have died, 20 injured and 1 million and 700 thousand who live in the area are affected in some way by the Fuego volcano eruption in Guatemala, 40 km southwest of the capital. This eruption, which occurred yesterday afternoon, local time, is the second recorded this year. According to the information sent to Agenzia Fides, the National Coordinator for Disaster Reduction of Guatemala (Conred), said that among the injured, 12 are children, four of which suffered third-degree burns. He also confirmed that 1.7 million people live in the area affected by the phenomenon. Sergio García, director of Conred, said that the community of El Rodeo was one of the most damaged, because it was buried by lava and ash: "There are missing people, but we do not know how many". The government of Guatemala, in the early hours of today, June 4, has decreed the state of public calamity in the departments of Chimaltenango, Escuintla and Sacatepéquez, the most affected by the Fuego volcano eruption. Furthermore, national mourning was declared for three days throughout Guatemala.